Customers who wish to develop the spooling business are often supplying pancakes of material to their customers and have had a request to supply spools. This can be achieved by using our single station starter pack which has the capability of taking a single pancake and creating a spool from this. Typically a spool will contain 10 pancakes of material. 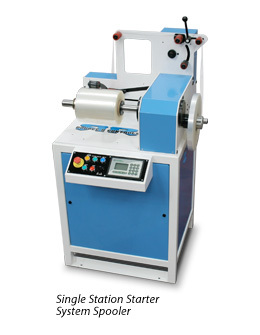 Our single station starter pack is a low cost unit and provides this facility. Pancakes are spliced creating the spool required for the end user. This means that the end user has a longer length of material and, therefore, can run their equipment for a longer period without having to stop and splice the pancake. 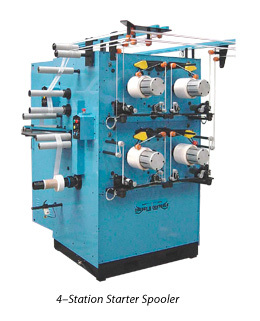 If the production requirement increases then the converter can move to a larger system which will take multiple pancakes and spool them simultaneously. We have supplied, on many occasions, our 4-station starter pack which has ultimately increased to 8-stations due to the increase in production requirements. Generally this equipment is processing narrower width materials over the range 6 mm to 30 mm and the end user has a requirement for both pancakes and spools, therefore, allowing the product to be made in a single format i.e. pancakes and then transferred to spools if required. As the business increases the equipment would move towards the contract spooling equipment which can have heads ranging from 6-stations to 48-stations depending on the particular requirements and the production needs. De-spooling equipment is also available from Double R which ranges from a simple manually braked de-spooler up to a more sophisticated driven de-spooler for operating at speeds of 600 metre per minute.